HowdyFrom.com uses Google Maps to help travellers create a travel route, location by location, that they can then share with friends to give a step-by-step route overview of their journey. The aim of the site is to help travellers plan or share a travel itinerary by showing the route, along with key destinations and attractions. 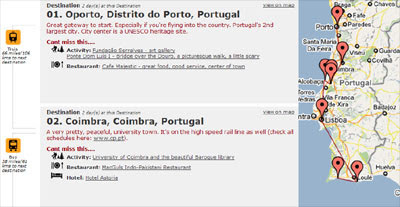 The map is generated as the user keeps building out the itinerary and adding destinations. You can also use HowdyFrom.com to browse global travel itineraries created by others, submitted and rated by the site users.